Brentech's as a service provider. You're inundated with critical business operations issues, with looming deadlines, projects to manage and new ones to roll out, with no relief in sight, You need BrenTech Inc. to step in to assist in your IT Operations. Managed services is the additional assistance you need to save your day. With managed services, you'll be free from necessary, but time-consuming tasks. Tasks like monitoring and managing your IT infrastructure. You'll be free to focus your attentions on other valuable resources and strategic initiatives, while increasing efficiency and productivity. At BrenTech, we understand your circumstances are unique to your business and that you need more than just extra staff, you need the knowledge and experience which BrenTech Inc. offers. That’s why at BrenTech, we staff highly skilled and certified engineers providing expert solutions for your IT Infrastructure. With BrenTech Inc. our managed services are a turnkey, full-service IT solution that includes the best of class, certified experts in the industry, 24/7 helpdesk support, ITIL best practices in IT managed hosting and world-class technology. All of these services are wrapped in a high availability service level agreement that guarantees your satisfaction. BrenTech Inc. managed services alleviate the constant head ache of managing your own servers and services. 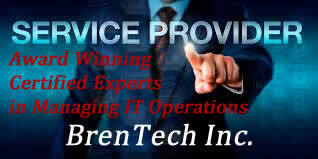 BrenTech Inc. effectively becomes an extension of your company’s IT department. With BrenTech Inc., you can leverage the latest technologies, security and services without worrying about hardware or software issues associated with maintaining your business environment. We know what it takes to follow through with valuable infrastructure services, ultimately, creating less overhead and a greate return on your IT investment. Let us at BrenTech Inc. help you meet your deadlines, exceed your goals and deliver the quality of services you deserve building your IT team.